NAI Estate Fellows modernises the Kupiec Poznański building. A modern design of the entrance and the elevators’ hall, a comfortable relaxation zone on the outdoor terrace and a stylish mural on one of the external walls – these are some of the modernisations already in place in the Kupiec Poznański building, and there are some more to come until the end of this year. For the Kupiec Poznański building 2018 started with changes: the office entrance from the side of the Strzelecka Street was completely modernised. The walls and floors were covered with modern, white sinter, which provides a very nice contrast with a wall covered with moss. The elevators’ hall and toilets on the 5th floor were also tiled with white sinter and illuminated with modern LED lighting. Four out of five building elevators were replaced. The refurbishment of the entire hall on the 5th floor of the building was completed in June. The walls were repainted and the floor got a new stylish carpet, which improves the comfort of the users of offices. The new look of the hall has got one more element – black and white posters of Szymon Brodziak from the Brodziak Gallery, enclosed in beautiful frames. The summer season at the Kupiec Poznański building was opened at the newly arranged outdoor terrace situated on the IInd floor. The new relaxation zone is equipped with comfortable sofas, chairs and garden benches, which ensure an ideal environment either for a moment of rest or a business meeting. For everyone who enjoys eating outdoors, part of the terrace was equipped with comfortable tables and chairs. The terrace also has several beautiful plants, lanterns and sunscreens. The three-storey-high wall of the office part of the building has become very colourful. 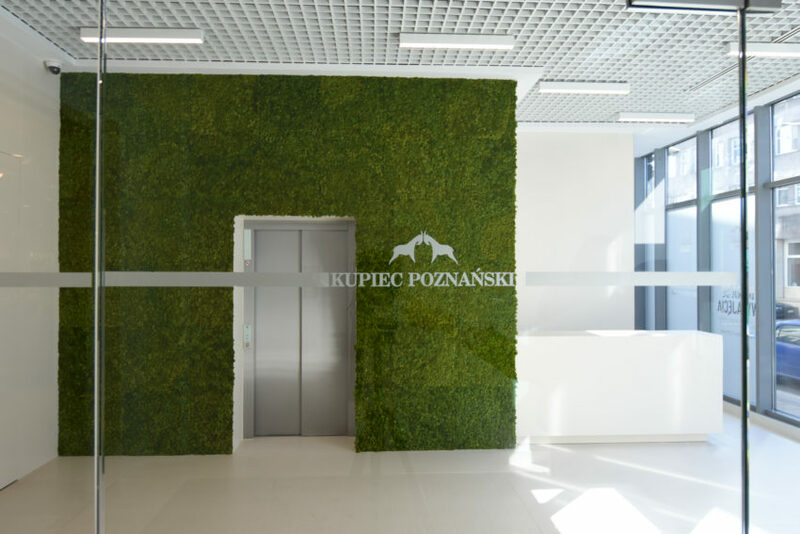 It is now decorated with a huge mural, which refers to the modern and business-like nature of the building tenants – several of the companies, which have their offices in the Kupiec building work in the IT sector. A few offices of the tenants were also subject to a thorough rearrangement – they were all completed with the use of cutting-edge solutions and in accordance with the latest trends. In order to meet the requirements of the tenants and the customers, and to help protect the environment, the Kupiec Poznański building has increased the number of bicycle racks, it marked clearly the parking places for bikes and applied high-definition monitoring, improving the safety of parked bikes. The entire parking area was marked anew – the elevators, the entrances and the directions of exit are now very visible, which facilitates the navigating in the building. The modernisation plans are being accomplished and the new ones are being developed –until the end of this year, the Kupiec Poznański building will undergo yet a few significant changes. Soon the modernisation of the 3rd floor and the entrance from the side of the Wrocławska Street is going to begin. An additional elevator will be installed and an elegant reception desk will be added. Soon the commercial part will also have a novelty – a co-working zone, which will merge the best qualities of the Kupiec building: an excellent location, beautiful views and people. „We appreciate a lot the trust of the building’s Owner, who handed it over to be managed by our company. The scope of our services related to the object includes the operational management, financial services, as well as marketing services. In the coming months we will follow up on the started modifications and optimisation of the office building and the mall, to provide even better services to the tenants and their customers” – Patrycja Masiarek, the Head of NAI Estate Fellows Branch in Poznań, says.